Last week, I attended a presentation entitled ‘The Future of Energy’ given by the company Good Energy hosted by the Pangbourne and Whitchurch Sustainability Group (PAWS). The firm was established to help promote sustainable energy production (ie non-fossil fuel) and thus help tackle the problem of climate change, which it sees as predominantly an energy problem. Good Energy offers a service allowing householders to purchase electricity that is 100% generated by sustainables. In addition, the company has been at the vanguard of microgeneration initiatives, allowing small electricity producers to sell their surpluses back onto the grid. Overall, Juliet Davenport, the CEO of Good Energy, appears to relish her role of providing a genuine alternative to the incumbent Big Six UK energy suppliers. 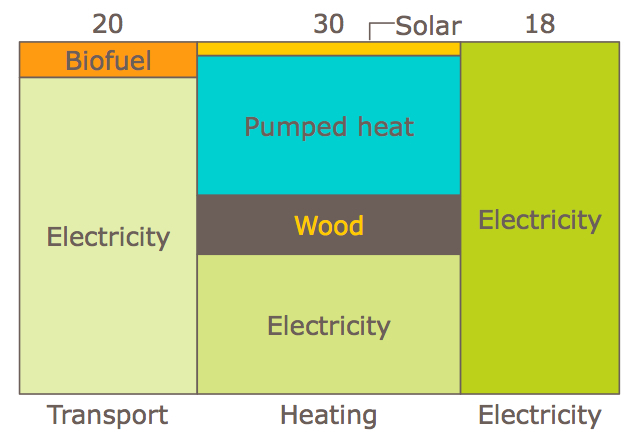 I was intrigued to see how a company with an established track record of bottom-up, micro-economic initiatives would paint a macro-economic big picture outlook of what energy provision in the UK could look like in the year 2050. The first thing that struck me was on how heavily their renewables scenario relied on the work of David MacKay, a professor in the Physics Department of Cambridge University and Chief Scientific Advisor to the Department of Energy and Climate Change. MacKay has done an invaluable service to all things sustainable by providing a non-nonsense tool kit of what would work (and what would not work) in the form of a resource web site at www.withouthotair.com. I own the book, ‘Sustainable Energy-Without the Hot Air’, which is an offspring of this site, and think it belongs on every bookshelf. What struck me most about this chart was the relatively modest role that electricity was currently playing in the mix, with only a 14% share. A new, post-carbon world was then presented for 2050. Note first that the average consumption has shrunk rapidly from 125 kWh/d to 68 kWh/d, or by about 46%. 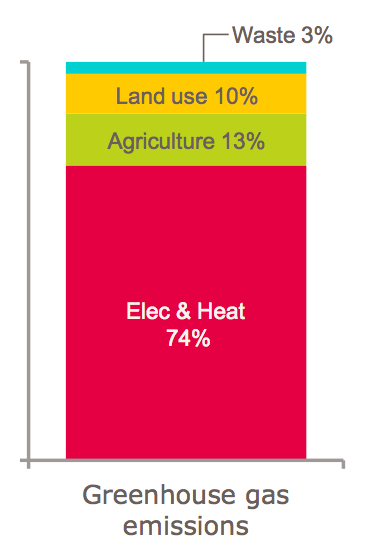 Further, for the transport sector, you can see that electricity has almost completely replaced fossil fuel. To achieve this end, electrical energy production has undergone a multi-decade boom, rising from 18 kWh/d per person to 38 kWh/d, a jump of 110%. 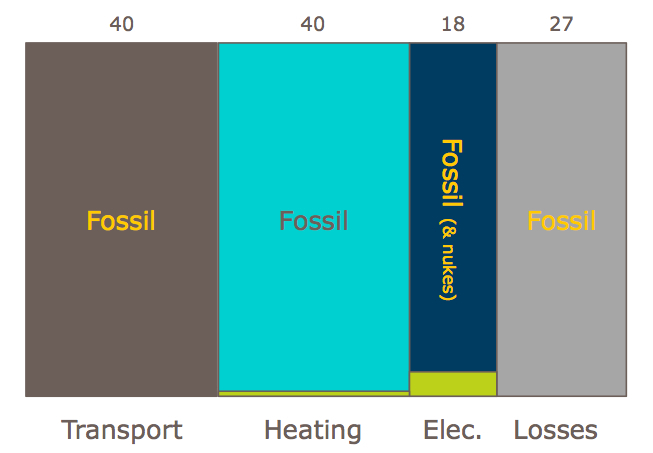 Fossil fuels are out of the mix by 2035, by which time we have also said goodbye to nuclear. Note that if we believe the demographers, total energy production would have jumped even higher on a percentage basis owing to current UK population projections. And to the question, “what renewable is doing the heavy lifting?” the answer from the chart below is plainly “wind”, with a combined onshore, offshore contribution of 25 kWh/d per person, which is almost 40% higher than total current per capita electricity consumption. 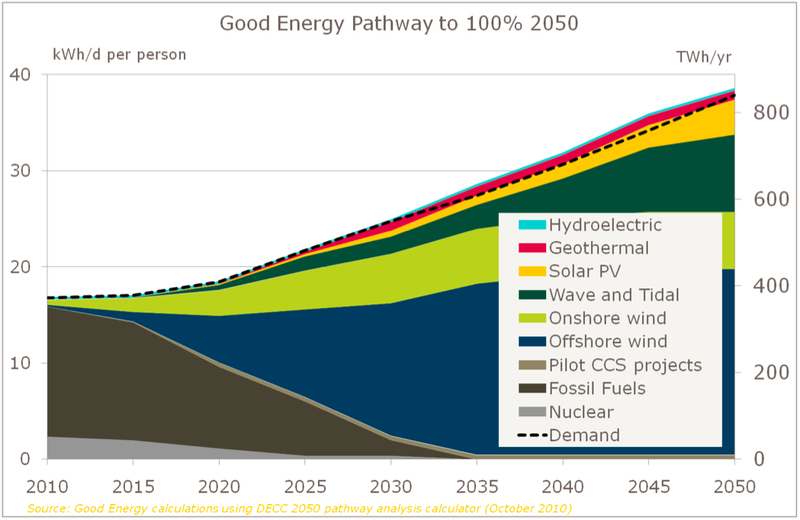 Now I think that Good Energy would be the first to agree that the projection is more of a thought exercise rather serious stab at what the UK energy world will like look in the 2050: a big ‘what if’. The presenter admitted that the underlying numbers were the work of a summer intern, who had been let loose on David MacKay’s database. I think most of us have tortured the numbers to make them speak at one time in our careers, and I suspect this may have happened in this particular case. More interesting, though, is how marginal the micro initiatives appear when compared with the overall picture 40 years out. And this was from a presentation that lauded the empowerment that would arise from micro-generation and decentralization. Mega wind projects, and especially mega offshore wind projects, are not within the financial capacity of individuals or local communities. As such, my initial suspicion would have been that the micro-generation figures would have been tortured most to produce the largest jumps, which does not appear the case. A few tentative conclusions. To dispense with fossil fuels altogether, each individual’s energy consumption has to take a pretty big hit. That said, through rejigging the ways in which we use energy, that is greater efficiency, we would be able to maintain standards of living pretty close to those of today (and new technology in fields such as medicine would likely take them higher). But to do that, the government has to become the major player in sustainables. A grass roots sustainable energy generation revolution just won’t cut it according to the Good Energy numbers. There is a darker future though. Through debt, demographics and peak resource constraints, the government could become severely impaired in its ability to set the energy agenda. This is the kind of scenario that could come out of the pages of Joseph Tainter’s ‘The Collapse of Complex Societies’. In such a situation, individuals and communities would be forced back onto their own energy generating abilities. 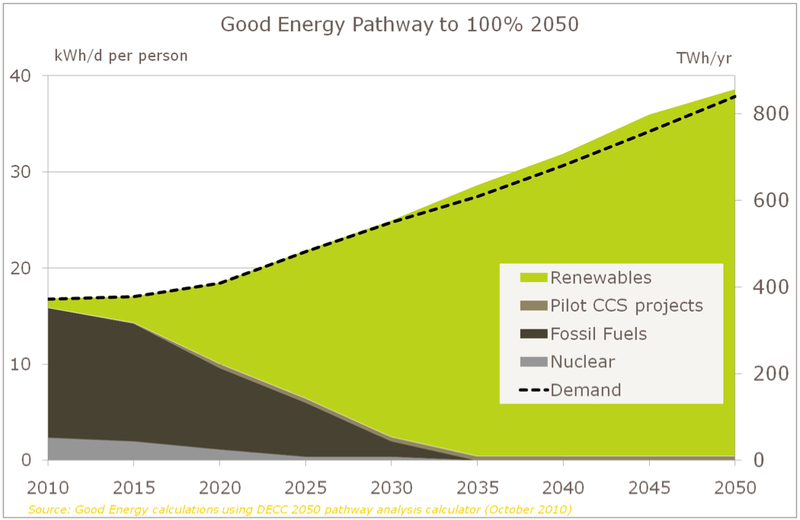 Accordingly, the energy descent could be from 100 kWh/d plus per person to 10 kWh/d or less. Now that would be a very different society from the one today.